Outline of Prophecy 20 - The End of the World? Uncovering - 3000 years of History! WHERE Is WEST GERMANY Headed? Is America Losing... 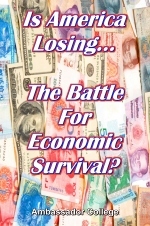 The Battle For Economic Survival? Beset by crime, campus riots, strikes, inflation, recession, and the agony of nine years of Vietnam, most Americans are utterly unaware of a global battle now under way which they could be losing by default. Within and without, the awesome American economy is facing serious challenges. Internally, the "inflationary recession" continues — although leading economists assure us that the recession is still relatively mild and will not develop into a major downturn. Measures to combat inflation, they say, are finally beginning to take hold. Externally, foreign bankers and economists are expressing doubts about America's economic future. Continued inflation and balance-of-payments deficits, year after year, are eroding confidence in the power of the dollar as the pivotal international currency. To some worried West Europeans, the major U.S. "export" today is inflation — and an inflationary psychology. "Frankly, we don't know where the U.S. is heading.... They [governmental leaders] haven't done what had to be done when it had to be done, and the situation has been dragging for a long time." On top of all this is the growing threat of worldwide trade war. In fact, the first warning shots of a vast, three-cornered trade battle have already been fired. The trouble is, few have heard the volley of shots. Charges and countercharges of protectionism, discrimination and bad faith are hurtling back and forth across both the Atlantic and the Pacific. The United States is growing increasingly impatient with Japanese restrictions on U.S. investments, and Common Market barriers to profitable U.S. farm exports. In turn, officials in Tokyo and Brussels (Common Market headquarters) warn of severe reprisals if Washington attempts, through new laws, to curb the rising tide of imports into the United States. Since early 1955, The PLAIN TRUTH has repeatedly warned of the specter of worldwide trade war. Backed up with facts and predictions from leading news sources, we have showed time and again what was bound to happen to the United States and Great Britain if our largely apathetic peoples didn't face up to the growing challenge of economic survival. Now, lamentably, those predictions are coming to pass. The United States is slowly but surely pricing itself out of one international market after another. Inflation — clipping along now at a 6.2% annual rate — has robbed the country of its traditional export-over-import surplus. Wage settlements, far out of line with production increases, add to the growing crisis of U.S. trade. Abroad, former enemies, now chief trade partners — Japan and Germany — continue their rapid industrial and economic growth. At the same time, they and other major trading nations are alarmed by the continual lack of economic discipline in the U.S. They are losing confidence in the ability of the world's leading banker nation to manage its own affairs. Largely because of America's economic difficulties, the whole fabric of international trade and economic cooperation, so carefully and painstakingly worked out in Washington and other leading world capitals, is threatened with dissolution. Ever since the conclusion of the Kennedy Round tariff talks in 1967, for example, it has been fairly clear that American public opinion is turning increasingly sour toward one chief trade ally — the European Common Market. But it was not always this way. States and others in lowering trade barriers, resolving problems of commerce and commodities and currency, and developing coordinated policies in all economic and diplomatic areas.... The United States will be ready for a declaration of interdependence.... We will be prepared to discuss with a united Europe the ways and means of forming a concrete Atlantic partnership." Now, according to one trade expert, "The bloom is off the rose." The talk in official circles in the U.S. is more of trade war than partnership. on the appearance of a narrow, inward-looking protectionist bloc, whose trade policies... increasingly discriminate against non-members." "We bought a pig in a poke. We have been taken.... The girl looked gorgeous for awhile. But now she is all warts. It is all very human, but the time has come to cut our losses." This is the increasingly bitter U.S. viewpoint. Europeans, on the other hand, are crying that the U.S., via its annual balance-of-payments deficit, is exporting inflation to Europe. And with these inflated dollars, they point out, American businesses have been buying up huge segments of Western European industry. The massive "Eurodollar" market — surplus dollars in circulation in Europe — now totals approximately $43,000,000,000. Overall, the United States profited economically from the formation of the Common Market in its first decade. This fact cannot be denied. U.S. exports to the Six rose by 153 percent compared to an 84 percent increase to non-Community countries. Agriculture, however, is the big obstacle. Over the last three years the U.S. has watched its position of key agricultural supplier to the Six gradually erode away. The drop in U.S. farm exports to the EEC in 1969 was 21 percent over the previous year. At the same time, rising subsidies to Common Market farmers have produced a glut of many commodities within Europe. Brussels officials, for example, are pondering over what to do with a steadily growing "butterberg" — a mountainous oversupply of butter. Some of these surpluses, according to U.S. officials, are being "dumped" into traditional American export markets below U.S. export price levels. J. Robert Shaetzel, American ambassador to the Common Market, cites, as examples, sales of wheat to Taiwan, lard to Britain, and feed grains to Japan. Shaetzel recently addressed an audience in Bonn, West Germany. He said that original American hopes for cooperation with the Common Market have "largely evaporated and been replaced by irritation, frustration, and a brooding sense of apprehension as to what the future will hold." West German Chancellor Willy Brandt has even gone so far as to propose a new American-European liaison office to discuss mounting trade problems between U.S. and the Common Market. Thus the "grand design" of a politically unified Western Europe and the United States waltzing harmoniously in an "Atlantic partnership" delirium is virtually dead. Washington's hopes in the early 1950's for a revitalized Japan, able to share the burden of leadership in the Pacific region, has worked out well — all too well. Given massive transfusions of economic assistance after the war (a sort of "Asian Marshall Plan"), protected by the U.S. nuclear umbrella (saving billions of dollars in defense), Japan has become an economic giant of the first magnitude. In staging the first world's fair in Asian history, Japan this year is showing the world just how far up the economic ladder she has risen. Japan has become an economic giant — far surpassing the dreams of the military "Greater East Asia Co-Prosperity Sphere" planners of the 1930's. Japanese industry, in octopus-like fashion, reaches around the earth. It devours voluminous supplies of raw materials. The ubiquitous "Made In Japan" label — no longer an epithet for cheapness — is affixed to every product under the Rising Sun. Japan has climbed to third place among industrial powers, outranked by only the United States and the closed industrial society of the Soviet Union. Japan's annual gross national product stands at between one fourth and one fifth that of the U. S. — $200,000,000,000, compared to $952,000,000,000. But Japan's yearly rate of growth has averaged three times that of the U.S. over the last decade. And very important — despite Japan's phenomenal rate of growth, her economy is the most disciplined and controlled of all major nations. There is no runaway inflation in Japan! By 1975, Japan's GNP could reach as high as $440,000,000,000. That awesome figure would be greater than today's combined gross incomes of Britain, West Germany and France. Japan's unstoppable growth has meant competition deluxe for the inflation-ridden United States. For years the U.S. held the advantage on the massive trade between the two nations. This is no longer the case. In 1969, the U.S. trade deficit with Japan reached approximately $1,500,000,000. In January of this year, Senator Jacob Javits told a trade meeting in Tokyo that Japan's refusal to compromise on trade problems — particularly textile exports to the U.S. — and open her markets to the United States threatens not only U.S. — Japanese relations but the trade structure of the entire world. "I warn you that protectionists are out in force in my country," the New York Senator told a luncheon meeting of the Japan-America Society and the American Chamber of Commerce in Japan. Two months later, one of America's top business leaders warned that Japan's delay in easing its present trade and economic restrictions could be the first step in an all-out global trade war. Donald M. Kendall, Chairman of the Emergency Committee on American Trade (ECAT) and President of Pepsi Cola, Inc., expressed concern that it was already almost too late to act. "If we have a trade war we will be right back in the 1930's," he said. Kendall told newsmen, at a breakfast meeting in Tokyo, that the pressure by the American textile industry for congressional restriction of synthetic and wool imports from Japan is matched by demands of the automobile, shoe and electronics industries. Why the mounting cry to do something about imports? Basic statistics tell the story. Imports into the United States have risen 90% since 1964. Six years ago, before the U.S. inflation rate began to worsen, the U.S. enjoyed a record $6,400,000,000 worth of exports over imports. Now the advantage has virtually disappeared. Yet, to make up for foreign military and economic assistance, plus the Indochina War, the U.S. needs a hefty trade surplus. The percentages of certain products that come to the U.S. from foreign sources is staggering. Here's a list of key items: steel, 13 percent; footwear, 33 percent; autos, 12 percent; woolen textiles, 26 percent; fish products, 50 percent; radios, 20 percent; television sets, 30 percent; bicycles, 28 percent; sweaters, 42 percent; home magnetic tapes, 88 percent. The White House is under increasingly bitter criticism from the textile industry. Pressure is building to write restrictive legislation that would reverse the long-time American trend toward international free trade. In 1969, a year that saw all imports into the United States rise by 8%, the flow of cotton, wool and man-made textiles rose by almost 18%. "Two out of every five men's wool suits sold last year were made from cloth manufactured in Japan," reports Stanley Nehmer, U.S. deputy assistant secretary of Commerce. The Commerce Department claims that from January, 1969, to January, 1970, a total of 50,000 jobs disappeared in the American textile and apparel 'industries. The loss was blamed primarily on imports. Attempts to get the Japanese textile industry to agree to voluntarily limit their exports to the United States have met a stone wall of resistance. According to the spokesman for the Japan Textile Federation, its group is "fully prepared for a protracted war with the U.S." over the matter of restricting exports of textile goods to America. The Japanese textile men blame the inflating U.S. economy rather than their own economic success for the textile impasse. Commerce Department officials who have been exerting pressure on the Japanese accuse them of displaying "arrogance" and "rudeness" in negotiations. Japanese trade negotiators are almost unanimously described as being rough and unyielding. The impasse over textiles is threatening to spill over into other industries. The New England footwear industry, once the largest and most important in the nation, is being decimated. In places like Haverhill, or Brockton, in Massachusetts, or Manchester, New Hampshire, factories are closing and workers are being laid off. American shoe manufacturers insist that imports are responsible for their plight. Like the textile men, they are demanding some type of quota arrangement to protect them from the rising flood of overseas merchandise. So far, Congress and the administration have been impervious to their pleas, but the shouts are getting louder and more desperate every day. According to one shoe company official in Haverhill, there were 23 footwear plants in that city a decade ago. "Only seven are left," he says, "and two of these are going out of business in the next 30 to 60 days. It's become a ghost town — I've got nobody to talk to anymore." Every U.S. company which makes and sells color television sets suffered financially the first quarter of this year. Two factors are responsible: the general economic slowdown — and the rising tide of imports. Joseph Wright, chairman of Zenith, charges that Japanese sets are being "dumped into the U.S. market at prices far below the Japanese home market price." In 1968, color sets imported from abroad totaled 243,000. In 1969, they rose to 447,000. This year they are coming in so fast they may reach the one million mark! "Nearly all the imports come from Japan," reports San Francisco newsman Milton Moskowitz. "They seem to be doing to the TV set manufacturers what Volkswagen and other foreign cars have done to the automotive industry." And the big lesson of it all is — if the United States had been living within its means, checking inflation, curbing excessive wage increases, and controlling government spending, the import problem would virtually cease to exist. How Long Can It Continue? In the light of all this, there are several important questions that need answering. How long can America's rapidly deteriorating export-import situation continue? More important, how long can America's annual balance-of-payments hemorrhage — a record $7,000,000,000 in 1969 alone — continue? How long will Europeans be willing to hold onto over 43,000,000,000 inflated "Eurodollars" backed up by a mere $12,000,000,000 in U.S. gold? How long will the strained foreign confidence in the undisciplined American economy continue? For a little while longer, at least. If there were a heavy run on the U.S. gold supply, the Treasury would simply stop selling gold. The last link between the dollar and gold would be cut. This would leave foreign banks holding over 30,000,000,000 totally unbacked dollars. The fact is, there simply is no other international reserve currency on the scene to replace the dollar — yet. But the seed has been planted for just such an alternate unit, should it become necessary. The six nations of the Common Market have already agreed to move toward the establishment of a Common Market reserve fund, and eventually a common currency. The current thinking is that it would take from five to nine years before such a currency unit could become a reality. But should there be another international currency crisis — such as the devaluation of the British pound sterling in 1967 — the timetable could be stepped up. None of America's trading partners, however jealous they may be of our abundant affluence, or however much they may want to improve their own trade account with the U.S., want to see an economic collapse in the United States. It is in virtually every nation's self-interest to see the shaky U.S. economy improved. No nation or bloc of nations eagerly anticipates assuming the burden of a world banker. But the United States must show some reassuring sign it is willing to tackle its mounting fiscal and economic problems — and this includes resolving the financially disastrous war in Asia. "The ultimate discipline for the international payments system as a whole is the degree of stability achieved by the U.S. dollar as the anchor currency. "That the United States should strive towards a major improvement in its external current account," he argued, "is not only in its interests but also in that of the entire Western world." Survival at Stake — Who Cares? Americans still have time to act — to act unitedly in their individual and national interests. Yet, instead of gearing up for the fight for economic survival, Americans are seemingly more interested in battling themselves. 1970 may go down in U.S. history as the Year of the Strike. All that matters for the average working man, it seems, is a fatter paycheck every year. Whether the increase is tied to an increase in productivity is of little consequence to him. President Nixon and Labor Secretary Shultz suggested last winter that unions should moderate their demands in coming bargaining talks. Otherwise they would run the risk of pricing their employers right out of the marketplace. One powerful labor boss retorted that no union leader would think of scaling down his demands. "If he does, he isn't going to be in the head of that union very long," he reasoned. Another top union leader, looking ahead to a major contract negotiation later this year, said: "We're going to the bargaining table in 1970 to get our equity, and we don't care what business' attitude may be or the attitude of the Nixon Administration may be." But who is going to act in the national interest? Where do we find sacrifice for the good of the nation — which in the end is for the good of every individual within the nation? In his new book, The End of the American Era, author Andrew Hacker laments that "a willingness to sacrifice is no longer in the American character." What was once a nation, writes Hacker, "has become simply an agglomeration of self-concerned individuals" — 200 million egos, as he captions one chapter. Americans are in "a stage of moral enervation," and "we lack the will" to continue being a great nation. What kills a nation? Lack of national spirit, purpose and unity — and an unwillingness to sacrifice for the common good. "Both the Japanese and the Germans are determined to be outstanding in the world," said Philip H. Abelson of the Carnegie Institute. "How can the United States, which is in some sense lethargic and without a sense of direction, compete with such energetic people, especially when we do not recognize that we are in a contest?" The Japanese have such a team spirit. The nation is determined to be Ichiban — Number One. Japanese industry, government and the public as a whole are concerted in the national efforts. The average Japanese has been willing to sacrifice for the good of his country, even to the point of accepting overcrowded living conditions, housing shortages, and other privations. The average Japanese workman "socks away" 18% of his take-home pay into savings. In West Germany, the figure is 11%. The United States? A mere 6% — with much of this diluted by the exploding growth of consumer credit. The Japanese have a sense of national purpose and will. Western Europeans are determined to overcome their historic differences to create a United Europe. And the United States? It's coming apart at the seams in all directions! "While each of us pursues his selfish interest and comforts himself by blaming others, the nation disintegrates. I used the phrase soberly: The nation disintegrates. "We face two overriding tasks. We must move vigorously to solve our most crucial problems. And we must heal the spirit of the nation. The two tasks are inseparable. If either is neglected, the other becomes impossible." It's time Americans wake up to the facts — and act before it's too late. There is still time for all Americans — governmental bodies, industry, labor unions and every individual — to act responsibly and do their part to stem inflation, and help put the nation's economic house back in order. But who will be the first labor union leader, for example, to tell his men honestly and frankly that the company and the nation can't afford them a pay raise this year. What about honest cuts in governmental spending? All that is needed are some good examples and forthright, unselfish leadership. There is still time left. There is still time left to rescue the dollar on the international front. Our creditors are more than willing — in their own interest — to give the U.S. time to put its economic house in order. If you want to know how you can act responsibly by putting your own personal house in order, read our fully illustrated booklet Managing Your Personal Finances.